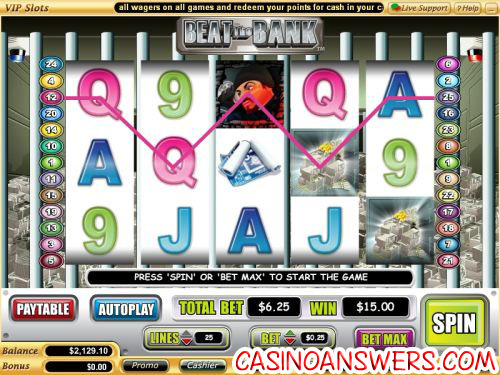 Beat The Bank Video Slot Guide & Review - Casino Answers! Beat the Bank is a 5-reel, 25-line video slot found at Vegas Technology and Random Logic casinos. For the purposes of this review, we will be reviewing the Vegas Technology version of the game, incase there are any differences. It has a wild substitute symbol, a scatter symbol, a free games feature and a bonus game. You can play Beat the Bank at Go Casino and Lucky Ace Casino. To play Beat the Bank, you must first place your bet. Available bets are $0.01, $0.05, $0.25, $0.50, $1, $5 and $10 per line. You can bet as little as a penny per spin and as much as $250 per spin, making Beat the Bank great for all players. Once you chosen your bet value, you can choose your number of paylines. Casino Answers recommends keeping all 25 lines active on Beat the Bank, thus maximizing your chances of getting a winning combination. To play all 25 paylines, hit the “Bet Max” button or to play with your settings, simply hit the “Spin” button. The top fixed jackpot in Beat the Bank is the security guard – worth up to 5000 coins. You will win this jackpot if you five security guard symbols appear on an active payline. The jewels symbol is also a significant win at 1000 coins. The wild symbol on Beat the Bank is the thief symbol. The wild symbol appears on the second through fourth reels and will substitute for all of the symbols in the game except the scattered safe symbol. The wild symbol does not payout on its own. When the thief appears on reels 2, 3 and 4 on the same spin, you will trigger Beat the Bank’s free spins feature. You will be awarded 15 free games with a 3X multiplier, meaning all of your prizes will be tripled. The free games feature can be re-triggered. It will be played at the lines and bet of the triggering game. Your free game wins will be added to your payline and scatter wins. The Beat the Bank bonus game feature is triggered when three or more scattered safe symbols appear anywhere on the reels at the same time. Beat the Bank’s bonus feature offers a maximum prize of up to 1024X your bet. In the game, you must find the money in either of the two safes. Each time you select the right safe, your prize is doubled. The game will continue until you cannot open a safe. You can trigger the bonus game during free spins. Your bonus game wins will be added to your payline and scatter wins. Beat the Bank has an autoplay feature, in which you can choose the number of spins (from 5 to 500) and the number of seconds between spins (from a quarter of a second to 2 seconds). Stop settings options are to stop once all spins are complete, to stop when a jackpot is won, to stop if a win exceeds or equals (from $50 to $250), to stop on any win or to stop if your credits are increased/decreased by (from $50 to $250). You can stop the autoplay feature whenever you wish. Beat the Bank has enough special features for our liking and is a lot of fun. Any video slot where you can win up to 1024X your bet in the bonus game in addition to 5000X your bet in the regular slot game is fine with us! Not to mention being able to win 15 free spins with a 3X multiplier. If you want to try and crack this safe, Go Casino will give you up to an astounding $20,000 free on your first twenty deposits plus four free tournament entries when you sign up at their casino. For that incredible welcome bonus offer and so much more, sign up now at Go Casino! Where can USA players play Beat the Bank? US players are welcome to sign up and deposit at Vegas Technology casinos such as Go Casino. Random Logic casinos, however, are not accepting players from the United States at this time. Do I need to download any software to play Beat the Bank? 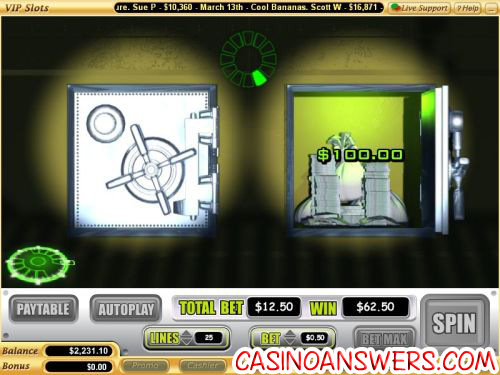 Go Casino offers both download and flash versions of their casino and Beat the Bank is one of the many games offered on the flash version. If you don’t have Flash installed on your computer, you can download the newest version of Adobe Flash Player. Does Beat the Bank offer a progressive jackpot? No, Beat the Bank does not have a progressive jackpot. Beat the Bank has a top fixed jackpot of 5000X and a bonus game where you can win up to 1024X. If you are looking for a progressive jackpot, you can find several at Go Casino such as Mega Money Mine and Pay Dirt. For Random Logic players, Lucky Ace Casino offers several progressive jackpots as well, including Millionaire Genie and Marvel Comics Jackpot Slots. What is a good game show slot machine? What is a fun slot machine?